According to Piaget’s stages of child development, children exhibit magical thinking when they investigate the world around them and come to conclusions that are beyond the ordinary boundaries of logic, reason and reality. 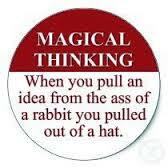 Magical thinking occurs during the preoperational stage which ranges from ages 2-7. Kids during this stage are very egocentric and don’t understand cause and effect. As a result it is difficult for kids to differentiate between what is fantasy and what is reality. Children sometimes exhibit “magical thinking” and this can manifest when they act as “little magicians”, “little metaphysicians”, “little theologians” and “little story tellers” or “dramatists”, imagining other-worldly possibilities beyond logic and reason. Jean Piaget believed that children grew out of magical thinking replacing it with acquired logic and reason. As an adult, I have observed (and frankly participated in) varying degrees of magical thinking much to my chagrin. Some lines of thought are fun, such as superstitions, preferences, routines, traditions. Its all harmless, we all engage in some form of “magical thinking” from time to time. However, when I went to law school, we were taught that magical thinking has no place in policy making. Critical thinking and legal analysis requires logic, reason and relying on true discerniable facts and evidence to draw conclusions. In the adult world and policy making, “magical thinking” can be dangerous. Relying on circumstantial evidence is bad as is speculation and conjecture. Making things up in an egocentric manner has disturbing results. As an education policy advocate, I have been able to observe that the most ardent practitioners of magical thinking these days sadly are not children, but adults who practice in politics and those who make education policy. These officials seem to be making decisions and arriving at conclusions that simply defy logic, reason, are incredibly egocentric and are simply irrational, in my opinion. “Magical thinking,” also be defined as the belief that an object, action or circumstance not logically related to a course of events can influence its outcome, has no place in education pedagogy or policy making. Yet, we see these egocentric policies being implemented despite proof and lack of evidence. Common core, is one such consequence of egocentric, adult onset “magical thinking” that has become disturbing education policy in NYS. How was common core concieved? Prof. Thomas Newkirk is director of the Literacy Institute at the University of New Hampshire. He has studied writing and literacy at all levels of proficiency, from the beginning scribbles of four year-olds to the personal essays of first-year college students. He has been honored by the University of New Hampshire for his research, and he has received the Lindberg Award from the College of Liberal Arts for excellence as a scholar and teacher. Although he has expressed a desire to give the common core standards a chance in the past, Prof. Newkirk has also been very critical of the common core standards going so far as to literally lambasting them. Newkirk does not support aspects of common core including close reading as the architects of the measure had intended. In one of my favorite pieces, Newkirk asserts that the expectations of common core are illusory and unrealistic. The notion that every child must meet the same standards, at the same time in the same way is simply illogical, amounts to fantasy and is tantamount to “magical thinking”. Years ago, my family enjoyed playing a “Sesame Street” record in which a king was so grateful when the fire department put out a royal fire that he declared everyone in his kingdom would be a fireman. Of course, problems arose: There was no one to cook his meals because everyone was a fireman. The moral, I suppose, was that we need different professions, something the king eventually realized. But I loved the magical bravado of the king’s just declaring everyone a fireman—and it happened. We get our fair share of magical thinking in the standards movement, such as the goal that every student in the country would be at the proficient level in reading and math by 2014, even though only about a third of U.S. students were at that level when the No Child Left Behind law was enacted. Proponents tried to make this unrealistic goal sound common-sensical—shouldn’t all kids read at grade level?—when in fact we had never been even close to having this level as the norm, let alone the universal requirement. Those of us who questioned the realism of this standard must surely have appeared as pessimists, spoilsports, or defeatists. But as any decent weight-reduction counselor knows, few things can be more damaging than unrealistic goals. They set us up for failure. We are now paying the price of this lack of realism. It corrupted the setting of state standards, with some states redefining proficient downward, often way downward. In my own small state of New Hampshire, which has scored among the top states in reading and math on national assessments, over 60 percent of schools are designated “in need of improvement” under No Child Left Behind. And the machinery of NCLB will only catch more unless radically modified. As any decent weight-reduction counselor knows, few things can be more damaging than unrealistic goals. They set us up for failure. The move to “common-core standards” is widely seen as a step forward—with rigorous and uniform standards to be in place in almost all states, so that U.S. students can become career- and college-ready. The College Board (a major “client” of the Educational Testing Service) and ACT Inc. were given roles in drafting the proposals of the Common Core State Standards Initiative, leaving some of us to wonder if there was not a conflict of interest involved. Can we be sure that these organizations, so tied to existing testing instruments, will not benefit financially from developing products that align with the standards they helped create? But leaving aside concerns about possible conflicts, these standards are one more example of magical thinking: the universalization of “advanced placement.” The framers of the common-core standards have consistently taken a level of proficiency attained by the most accomplished students and made it a general expectation. Like the king on the “Sesame Street” record, they have declared everyone AP. While a few students may be able to accomplish this independently, the standard is wildly beyond the range of most 2nd graders, particularly boys, unless the activity is made into a formula with boxes to be filled in (and I fully expect these boxes are being created in curricular material as I write). This sophisticated task of text analysis is daunting for AP literature students, and I would argue more appropriate for college literature classes. Again, it’s wildly unrealistic as a general standard for all 12th grade students, many of whom struggle with the general sense of a Shakespeare play. Many of the objectives for persuasive writing at this age level describe the work I do with advanced college students—particularly the handling of multiple perspectives on a topic, a very complex skill for young writers. All of which makes me wonder, ungenerously, if those who created these standards have really taught in actual schools, with actual students, and actual teaching loads of over 120 students. I suppose we can declare high school the new college, but saying so does not make it so, or even make it possible. So I see two possibilities. One would be mass failure, if these standards are actually applied to all students and rigorously tested. Teachers and students would once again be set up for failure. The other, more likely result is a version of “just kidding.” These complex standards will morph into more modest “real” standards—ones that are tested through modifications to tests like the AP or the SAT writing test, or current state writing tests. In either case, the core standards as written are utopian fictions, illusory, magical thinking. 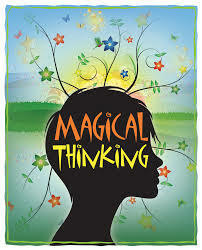 Read “Standards and the Art of Magical Thinking” Ed Week piece here. Listen to the podcast featuring Prof. Newkirk here. From a transactional perspective, the text is not a defined space in which meaning exists, to be found by the reader. Rather the act of reading is an experience, in time, shaped by the writer, but profoundly influenced by the prior knowledge, purposes, emotional responses, and acts of attention of the reader. grass, the dog for a hare, and the stork for a lizard. Meaning is made, not found. Read Prof. Newkirk’s essay “Our Metaphors Matter” here. In another scathing piece, Professor Thomas Newkirk laid out the problems with Common Core in a post script to an earlier piece he had written titled “Speaking Back to the Common Core”. Newkirk lambastes common core finding that the measure is not supportable, will lead to many problems and that the pedagogy rests on sheer fantasy. The Common Core initiative is a triumph of branding. The standards are portrayed as so consensual, so universally endorsed, so thoroughly researched and vetted, so self-evidently necessary to economic progress, so broadly representative of beliefs in the educational community—that they cease to be even debatable. They are held in common; they penetrate to the core of our educational aspirations, uniting even those who might usually disagree. We can be freed from noisy disagreement, and should get on with the work of reform. 2. Misdiagnosis of the problem. 4. A sterile view of reading. 5. Underplaying role of narrative. 6. A reform that gives extraordinary power to standardized tests. 7. A bonanza for commercialism. 9. Drowning out other conversations. Read “Speaking Back to the Common Core” in full here. Lastly, in “How We Really Comprehend Non Fiction”, Newkirk criticizes the common core expectations in dealing with informational text. You be the judge. Which of these two sentences is easier to read? The Appeals Court’s position is one of rejection concerning the proposed individual mandate. The Appeals Court has rejected the proposed individual mandate. The Appeals Court, in a unanimous ruling, rejected the proposed individual mandate. This sentence has almost the same number of words as the first one I cited, but it retains an architecture—the subject-verb-object sequence—that is easier to process. We innately prefer sentences that tell a small story: An agent is acting, having an effect on something (Williams, 2002). We have a craving for narrative. This simple comparison can help us move to a wider question about how we read longer stretches of writing in various genres, many of which are not thought of as narrative. The conventional wisdom is that we employ radically different reading skills when we read (or write) texts that are variously called informational, analytic, or argumentative—indeed, that moving toward these texts (and away from narrative) should be a feature of high school and college reading. The clear message in the common core literacy standards is that narrative reading is to be reduced in the upper grades and that college-ready students need to master the more demanding tasks of reading texts that are notnarrative (see Coleman & Pimental, 2011). live experience, which gives it what rhetoricians call presence. This work confirms the claim of Robert Frost that “everything written is as good as it is dramatic. It need not declare itself in form, but it is drama or it is nothing” (quoted in Poirier, 1997, p. 452). So here is my modest proposition—that narrative is the deep structure of all good writing. All good writing. We struggle with writers who dispense with narrative form and simply present information because we are given no frame for comprehension. Mark Turner (1996), a cognitive psychologist and literary critic, puts it this way: “Narrative imagining—story—is the fundamental instrument of thought. Rational capacities depend on it. It is our chief means of looking into the future, of predicting, of planning, of explaining” (pp. 4–5) (see also Eubanks, 2004). This claim is true for even the most specialized academic writing; even research reports must tell a story. We never really read for raw information. We can’t. So-called “informational texts” work only when the writer has been able to establish a set of expectations to drive the reading. Otherwise, there is no motor, no dynamic forward movement. This frame stabilizes the reading, gives it purpose, provides a pattern to place the “information” in. If readers fail to detect this pattern (or writers fail to construct it), they simply drift on, defeated by the specifics of the text. I am talking about more than a thesis. I mean a human problem or situation that needs examination, something that matters, that calls for writing. So rather than pretending to move beyond narrative, we should be teaching students how it works in their reading— and how to employ narrative in their writing. Read “How we really comprehend non fiction” here. Although the arhictect of common core David Coleman has said that students should focus on non fiction, it is clear that Prof. Thomas Newkirk believes the pedagogy amounts to fiction – fantasy and is tantamount to “magical thinking” in and of itself. 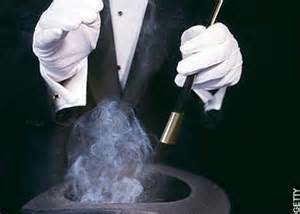 To that, I say “abracadabra”….. lets practice some magic of our own and make common core disappear.